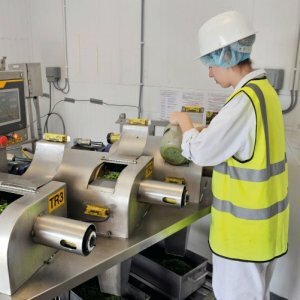 Pelican’s food team recently visited Birds Eye’s pea farms and factory to find out just how the frozen food giant harvests millions of peas every year. Looking down at the eight plates, it gave pea green a completely new meaning. “We’re looking for quite a dark green and an even colour,” Aimee Dawson tells us. Aimee is Birds Eye Agricultural Manager – she’s also a resident pea expert. This is her third plate of peas today, but she insists she never gets fed up of them. In fact, she’ll probably have them for dinner too. There are many shades of pea green it turns out, but eagle-eyed Aimee is quick to spot the Birds Eye plate from amongst the competition. “That’s the one our consumer wants,” she says enthusiastically. She also points out to us what makes the perfect pea: it must be tender, the skin not too thick and uniform in shape and colour. We’re in the epi-centre of this season’s pea harvest – an event which has taken nine months of meticulous planning. So far, it appears to be running like clockwork. It’s no wonder Aimee, and indeed every member of the operation, are so happy. “There’s a lot of anticipation in the run up to the harvest,” says Steve Walker-Smith, Site Manager at the XPO Logistics factory where the peas are processed in partnership with Birds Eye. 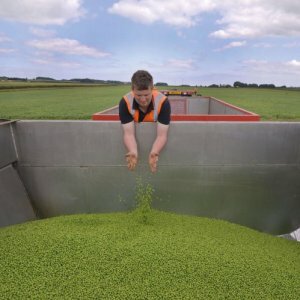 The pea harvest is a 24-hour operation which runs throughout fields and farms in Hull’s nutrient-rich landscape. 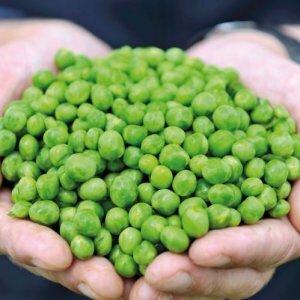 Birds Eye, which represents half of the overall frozen pea market, boasts 15 varieties of peas – including five exclusive varieties. Its farmers don’t grow peas for anyone else. The harvesting process starts in the early hours of the morning when a team of fieldsmen descend on fields across the region to hand-pick and taste peas in search of the day’s ideal harvesting spot. The information is fed back to Birds Eye HQ to ensure the perfect pea and maximum productivity when the next day’s activities kicks off. On the field, harvesting itself is carried out by a team of drivers who operate state-of-the-art viners to pick and process the peas. Pods and vines are filtered back onto the land where they makes a mineral-rich compost ideal for agriculture. The peas are stored in the viner ready for transferral to the tractor which pulls up alongside every 15 minutes to receive the next load of freshly-picked crops. The tractor chugs across the field to an awaiting lorry – which once full (it really doesn’t take long) drives it just a few miles away to the factory in Hull. In the meantime, the tractor sends over the weight of the load so the factory can plan ahead. And so the operation goes on in rotation for the next few months. Watching the process in action is jaw-dropping and although technology plays its part, it’s clear that organisation and man-power is really at the heart of this whole operation. That, and commitment. I ask the drivers, who spend 12-hours a day ploughing the fields, if they ever get fed up of the task. The resounding answer is no, with one employee telling me he even came out of retirement to work on the harvest. That was over a decade ago, and he has no plans to hang up his boots yet. It’s clear that every member of the team plays a pivotal role in getting the peas to their final frozen state. Birds Eye peas famously go from picked to frozen in less than two and a half hours, and often it’s much less. Much of that timescale is dedicated to picking and driving the peas to the factory. Once they land at pea HQ they are processed in just 22 minutes. It’s even more impressive when you also hear the factory processes 60 tonnes of peas an hour – equivalent to 120,000 bags of frozen peas. After a sample is quality checked, each load is washed, before being blanched and blast frozen at -37 degrees to lock in nutrients and flavour. They are then stored frozen in bulk ready for packaging at another Birds Eye site. Being in charge of the largest pea factory in the world, Steve proudly tells us how Birds Eye produces more than 45,000 tonnes of peas every harvest season. “If all the peas produced were lined up they would stretch to the moon and back,” he declares. It might sound space age – but with 70 years of successful harvests under its belt, it’s clear Birds Eye has the process completely ‘sown up’.